The bad guys are taking advantage of innocent employees by posing as one of your organization’s executives or even your CEO. Using methods of urgency and authority, they intimidate you into buying gift cards for “business reasons”. 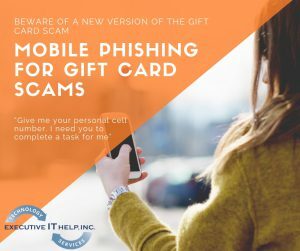 This trick has been around for a while, but recently these scammers are taking it one step further and requesting your personal cell number to communicate with you while you do what they ask. Here’s how it works: They send an “urgent” email that looks like it comes from an executive in your organization. They create a sense of urgency by using subject lines such as “QUICK RESPONSE”, and they intimidate you by saying: “Give me your personal cell number. I need you to complete a task for me”. Once the bad guy has your number they put even more pressure on you to complete the task before you have time to think! Do you recognize the email address? Even if the email appears to be legitimate, question it. Do you usually receive requests like this, or is this unusual? Call the executive or your supervisor to validate this request before responding or buying gift cards. Fadi Bayeh and his staff of technicians have provided exceptional support for our network infrastructure, workstations, cell phones, etc., and are currently implementing our managed wireless across the campus. As anyone in the business knows, technology change is exponential, we are fortunate to be engaged with a team of experts who help keep us informed and on target with technology on our campus." "Executive IT Help provides a level of service and expertise that has earned my complete trust and appreciation. I’ve utilized their expertise to upgrade our technology so that we are working in a faster, more secure environment. Their level of service exceeds my expectations consistently. They answer every call and every question promptly and efficiently. I wish I’d found them years ago. Executive It Help, Inc. understands the technological needs of their clients in a very “practical” way and they do everything possible to meet those needs." Scams by Text – Don’t Fall For It!